Is Our Hope Justified or Misplaced? In looking to answer the question posed, it is worth applying a technique Charlie Munger is a big advocate of, that being inversion; or reasoning backwards. I am going to use a slide from a paper Richard Zeckhauser wrote to illustrate what this means. 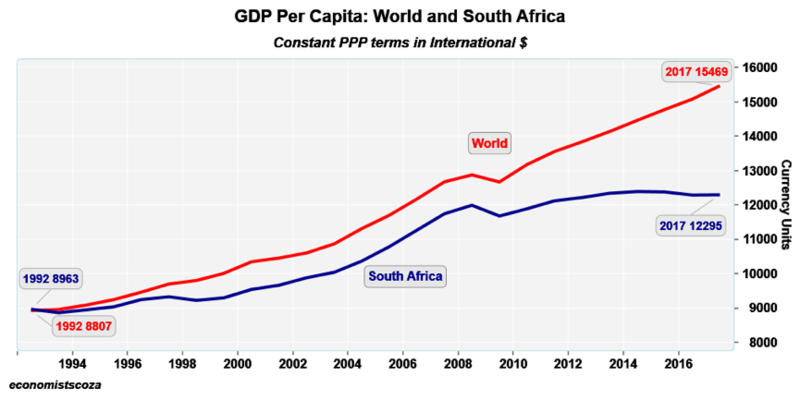 One thing is not open for debate; the outcome; South Africa has underperformed the world since 1994; markedly since 2009; see Figure 1. In working backwards, (inverting), could we have foreseen a poor outcome, thus answering the question posed; was the rally based on nothing more than hope? I posit we put the cart before the horse two decades ago, and in so doing have created a stiff headwind for ourselves. We are attempting to transform the country from a position of weakness, rather than strength. The most important thing to have done in 1994 was uplift the standard of education to world class levels for all South Africans, something the previous regime failed abysmally to do. Instead we elected to get the sequencing wrong, we promoted people beyond their natural level of competence in the name of transformation, and to better reflect the demographics of the country. Post 2009, the basis and calibre of appointments became even more questionable in some cases. 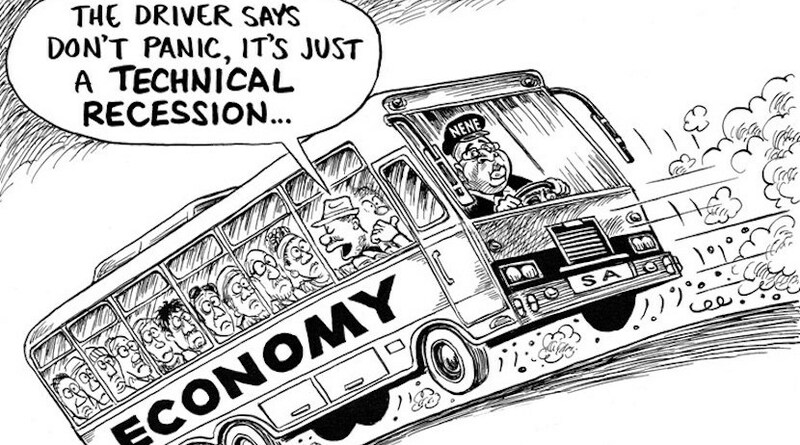 State capture and corruption aside, it is little wonder most SOEs (State Owned Enterprises) have become dysfunctional bodies absorbing large amounts of taxpayer money that could have been put to more productive use to uplift the impoverished and maintain infrastructure. One cannot apportion blame to many of those appointed to senior positions, most were the victims of an appalling education system under the previous regime; something the ANC have done nothing to remedy. An article carried by The Economist from a report ranking global education systems published by the OECD in 2015, placed South Africa 75th out of 76, with Mathematics and Science being particularly weak. One can use a simple analogy to illustrate the point; would anyone sane expect someone with no flying experience to land a sophisticated Boeing? The simple answer is no. Why then would anyone foresee a different outcome when appointing people with similar credentials or marginally better to complex businesses like Eskom, to name but one? To answer the question: I believe the rally earlier this year was one of hope/and or relief. In reality the ANC and our President have some soul searching to do, in putting the cart before the horse, we are forcing through transformation of the economy from a position of weakness, unsurprisingly we are getting a poor outcome. Had we educated our people to world class levels, transformation would have happened naturally, albeit at a slower pace initially – but most importantly, from a position of strength. Government have failed South Africans in much the same way the previous regime did; they have denied the majority a good education, the bedrock of a prosperous society for all – not a small elite, as was the case pre 1994. Alas, post 1994 has been no different, the only change being to the cast. Rather than being a huge tailwind, the demographics of the country have now become a millstone. Around half the population are under the age of 25; asking them to be patient while the wrongs of the past are righted, is a big ask and will take some delicate handling without resorting to populous “solutions.” The current emerging market landscape offers a stark warning to what happens when poor economic and social policies are followed. One could weave more into this, so doing would probably denigrate the fundamental principle binding South Africa with a less than optimum outcome; a haste to redress the sins of Apartheid, understandable as it is, without a concomitant commitment to put in place the building blocks to ensure all South Africans have the tools to contribute meaningfully to society – be it through a world class classical education or trade. Embracing mediocrity has never produced a winning nation. After graduating with a B Com Honours, Nigel Dunn moved into stockbroking close on three decades ago. He has been a registered member of the South African Institute of Stockbrokers since 1994. He started his career in 1987 advising individuals, moved to research, company specific and of a strategic nature, before settling in fund management, both for private clients and pension funds. He was a partner of Anderson Wilson, subsequently acquired by Standard Bank, where he became a director of Standard Equities. Thereafter he moved to Investec Securities where he managed funds for private clients, family trusts and helped on the corporate broking desk. Most recently he has been managing discretionary funds for clients, proprietary trading in addition to generating his own corporate research. Of late he has started to write articles of a market related nature intended to stimulate thought and debate.